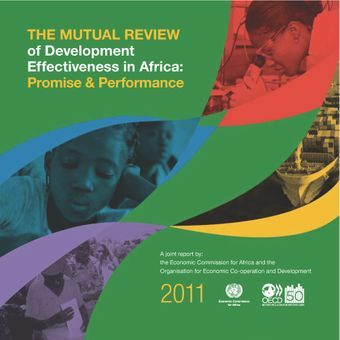 The Mutual Review of Development Effectiveness is an exercise in mutual accountability undertaken jointly by the UN Economic Commission for Africa and the OECD following a request of NEPAD Heads of State and Government in 2003. Its purpose is to assess what has been done by Africa and its development partners to deliver commitments in relation to development in Africa, what results have been achieved, and what the key future priorities are. It complements the self-assessments produced by each side to the partnership. The meeting of AU/ECA Finance Ministers in March 2011 reaffirmed the value of this exercise and asked for more regular reports to be produced. In response to this request, an interim 2011 report based on information available as at mid-April was published in May 2011. The main 2011 report follows the same structure as the interim and previous reports, divided into 4 main ‘clusters’ of issues covering: sustainable economic growth, investing in people, good governance and financing for development.